Joyce A. Haskins, 76, of Colona, joined dad Friday, May 26, 2017, surrounded by loved ones. Her journey was peaceful and without pain. Joyce knew many people working at many Colona businesses, Gailearts, B&B Grocery, Green Park Pharmacy and B&B Hardware, Milan. She is survived by a sister, Lottie Reed, Coyne Center; son and daughter-in-law, Randy and Vinetta Haskins, Colona; three grandchildren, Randy Jr., Colona, Ross, Springfield, Jerry, Colona; and three great-grandchildren, Sophia, Ayden and Delilah. As per her wish, no services or visitation will be done. Quad Cities Cremation Center is assisting the family with arrangements. 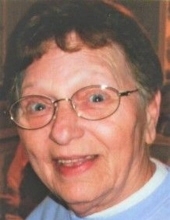 A celebration of her life will be held noon to 4 p.m. on June 17, at 907 7th St., Colona. To plant a tree in memory of Joyce A Haskins, please visit our Tribute Store. "Email Address" would like to share the life celebration of Joyce A Haskins. Click on the "link" to go to share a favorite memory or leave a condolence message for the family.